Mental health is a topic that has only very recently come into the forefront after an incredibly long period of silence. It is often something that people prefer not to address, or feel is not relevant to them and can in turn be a misunderstood subject. The negative stigma and discrimination around mental health can be driving force in stopping people with mental health disorders seek help. 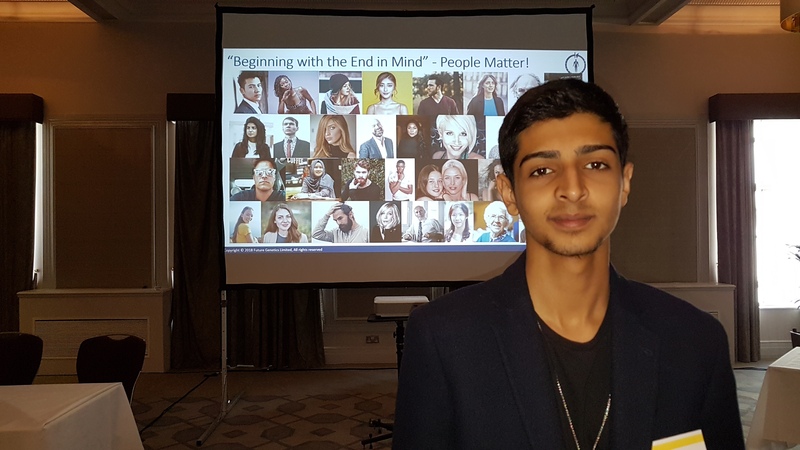 Therefore, it is important that we all contribute to raising awareness of the reality of mental health and its importance in people of all ages and backgrounds. My name is Sabrina and I am a Research Scientist at Future Genetics. From January 1999 to December 2017, the NHS carried out major surveys of the mental health of children and young people in England and published a report of the findings on the 22nd of November of this year. A number of different types of disorders were assessed for with ‘rigorous, detailed and consistent methods’. Amongst these disorders were; emotional disorders, behavioural disorders, hyperactivity disorders and less common disorders. 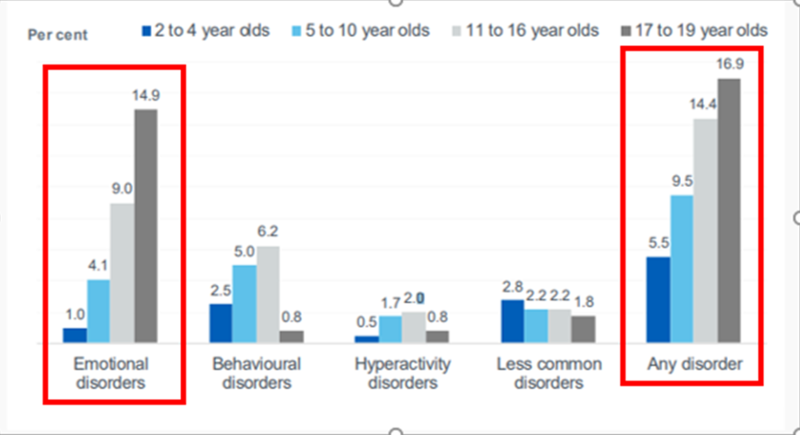 Overall, the results showed that one in eight (12.8%) of 5 to 19 year olds have at least one mental health disorder, primarily being emotional disorders, as you can see by this bar chart (Figure 1). This also represents the rise in rates of emotional mental health disorders as age increases. From ages 2 to 10, boys were more likely than girls to have a disorder, with boys aged 5 to 10 being almost twice as likely than girls of the same age to have a mental health disorder. Amongst the 11 to 16-year olds, girls and boys were equally likely to have a disorder. However, girls between the ages of 17 and 19 were more than twice as likely as boys to have a disorder. Compared with any other demographic group, rates of emotional mental disorders and self-harm were reported to be the highest in young women aged 17 to 19, as presented in the NHS survey. Over half (52.7%) of these girls reported to have self-harmed or had attempted to commit suicide. 5.6% of the girls identified with Body Dysmorphia (BDD) and 1.6% had an eating disorder. There are multiple influences that can increase the onset of mental health disorders in children, with one being the functioning of the child’s family. In some cases, however, mental health disorders may be the cause of problems within families, which therefore forms a vicious cycle. A child’s mental health can also be affected by their parent’s mental health, the child’s support network, how much they participate in their social surrounding and adverse life events (e.g. Parental separation and/or financial struggles at home). Other factors that can influence a child’s mental health is their physical well-being and daily social media use. Children aged 11 to 19 with a mental disorder were 10% more likely to use social media daily compared to children of the same age without a disorder. A growing problem linked to social media is the impact it has on young people’s self-esteem, as they are constantly comparing themselves to the perfect picture and consequently thinking less of their own lives. This survey showed that 1 in 4 children (24.1%) with a disorder had no professional or informal support. This support is critical and can prove to be life-saving in some cases. It is important to acknowledge that regardless of what their age is, we should all be thinking about improving and supporting the mental health of children and young people and raising awareness of this issue. 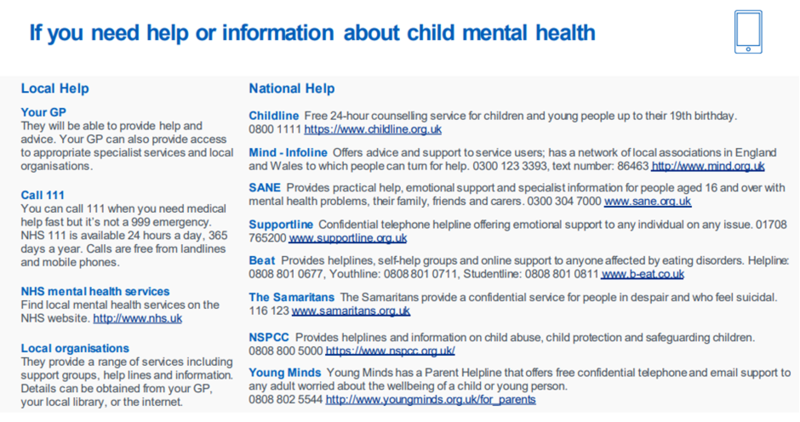 If you need any help or information regarding child mental health, please phone or visit any of the numbers or sites down below. Hospital Admissions – are they necessary? The NHS has reported that presently, around 2500 hospital beds are unnecessarily occupied by patients who are well and fit enough to be discharged but choose to stay due to the unavailability or delay of social care and support in their homes or communities. Going to the hospital is usually the only option for some. My name is Sabrina and I am a Research Scientist at Future Genetics. On the 21st of November, Theresa May made a public announcement explaining that more NHS patients will be cared for and supported in their own homes and local communities. Subsequently, this will lessen unnecessary hospital stays and admissions and allow people to receive treatment specific to them, closer to home. In addition to the existing budget for primary and community healthcare, the prime minister has set out a major investment boost in these services; worth £3.5 billion a year in real terms by 2023/4, as part of the NHS Long Term Plan. This will go towards building community-based rapid response teams; consisting of doctors, nurses and physiotherapist who will be able to give urgent care and support to patients as well as emergency treatment, preventing the need to go to hospital. The NHS Long Term Plan will also help to provide more dedicated support to older people in care homes, as most of the time hospital admissions from care homes are avoidable. For some, especially older people, needlessly staying in a hospital bed for extended periods of time could be detrimental to their health. The longer they stay in bed, the faster their muscles waste, which not only risks their health but also their independence. This plan would allow patients to get the care they specifically need in order to stay healthy and help them to stay independent for longer. It helps not only the patients, but also lessens the burden on the NHS. In her announcement, Theresa May mentioned that ‘the longer a patient stays in hospital, the more it costs the NHS and the more pressure is put on the hard-working staff’. With the pressure the NHS is facing, in most cases, the best they can offer is a standard ‘one size fits all’ approach, which may not prove to be effective in some groups of patients and so time, money and resources get wasted. This new focus on primary and community healthcare, can allow for a more tailored approach specific to the needs of the individual. Delays are also a huge problem which are caused as a result of unnecessary hospital admission and stays. This can be delays in waiting times, delays for other patients, delays in routine operations and delays in transferring care between the NHS and social care services. The NHS Long Term Plan will help to aid patients in leaving sooner or even help to avoid them being admitted into hospital to begin with. Relieving this pressure on the NHS, could essentially free up to 2000-3000 beds. The extra time, money and resources saved could also be used to focus on preventative measures and cures, instead of management and control, in addition to more personalised treatment. This could be a big step for the NHS, but first the way in which primary and community healthcare work together must change. Neurological diseases are among the leading causes of mortality and disabilities in the elderly population. Parkinsonism, strokes and Dementia come under the umbrella term of Neurological diseases. These neurological diseases have a detrimental effect on not only the patient but their family and caregivers. They are also known to show substantial co-occurrence, therefore an individual with Dementia has an increased risk of stroke. The overall conclusion of this research study was that one in two women and one in three men will develop a Neurological disease in their lifetime. This shows it is more common in women than men, throughout the study data on women was compared with men. The study mainly focuses on age, as all of the individuals involved were above the age of 45. There was evidence to show women are more likely to develop a neurological disease. Not only as a female but a female scientist I believe it is important to raise awareness. Through this article I hope to educate more women about the risk of these common disease allowing us to further educate more women. In the study Dementia was seen to be the most common disease with a total of 1489 individual’s being diagnosed, then 1,285 suffered from a stroke. Ischemic strokes were more common at 64.7% and 9.8% had a hemorrhagic stroke. Parkinsonism was the least common neurological disease with 263 individuals’ being diagnosed. A lot of individual’s are only diagnosed with one of the diseases in their lifespan. However, at the age of 45 there was a substantial risk of being diagnosed with multiple diseases. A total of 438 individuals were diagnosed with multiple diseases. Following the trend of more women being affected by one neurological disease, more women were diagnosed with multiple diseases a total of 4% Versus 3% of men. Women were also almost twice as likely to be diagnosed with both stroke and dementia. These high figures show the importance of the need for better prevention strategies. Neurological diseases get under investigated in comparison to common diseases such as cancer and heart disease. This is because Cancer and Heart disease commonly affect middle aged individual and and neurological diseases normally have a later onset. According to this study, this should not be the case as the lifetime risk of developing Breast cancer in 1 in 8 compared to 1 in 2 developing a neurological disease. The same principle applies for heart disease which affects 1 in 4 people. Those who had been diagnosed with one of the neurological diseases had a higher prevalence of high blood pressure, type 2 diabetes and an abnormal heart rhythm. These findings clearly display the importance of preventative interventions which will delay the onset. It has been estimated that if the onset of the diseases is delayed by 1 to 3 years, the remaining risk of developing would be reduced by 20% in 45-year olds and 50% in those older than 85. This huge reduction in both age categories, this demonstrates the importance of the development of a treatment to delay the onset and to maintain a healthy brain. This is one of Future genetics aims. Hi, my name is Penny, and I am a research scientist at Future Genetics. 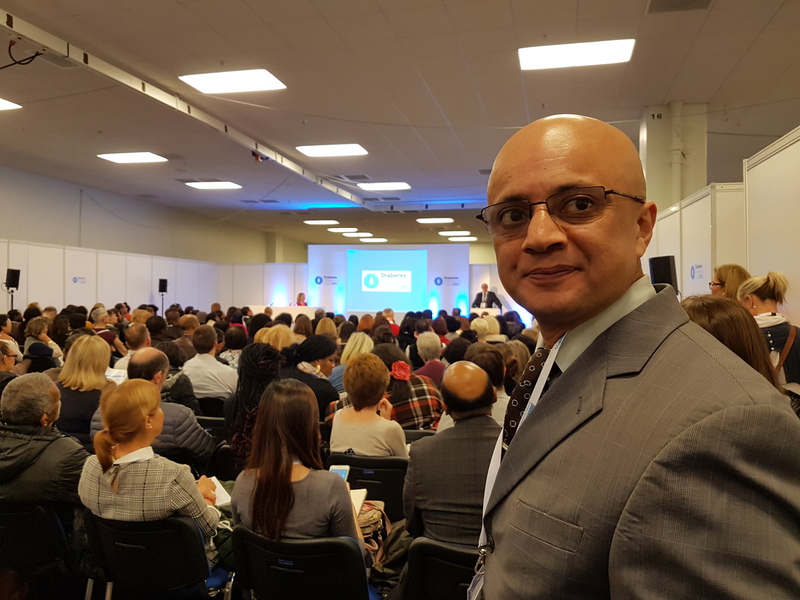 I attended the annual National Association of Primary Care Conference that was held at the NEC earlier this month. It was a great event which encouraged discussion and debate around management of patients in a primary care setting. 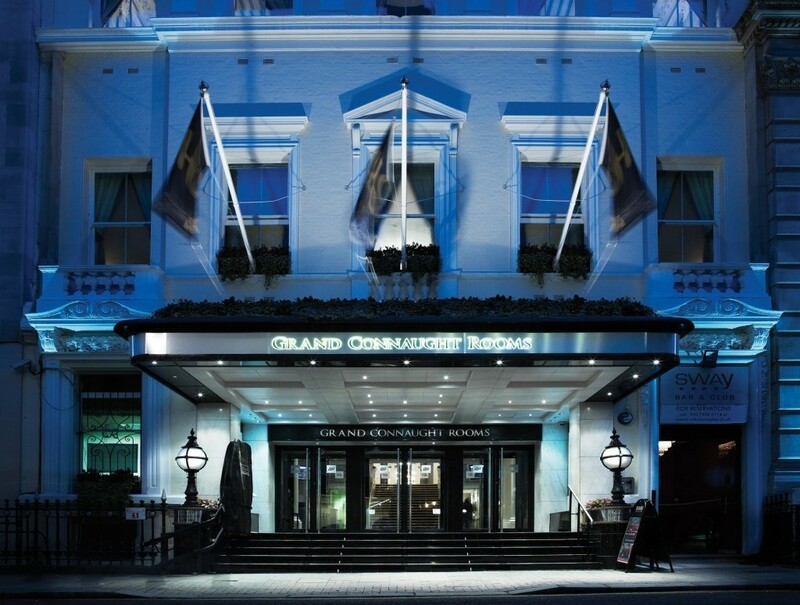 In this article, I am going to summarise one of the presentations that particularly stood out for me. I think its message is well-aligned to the ethos and principle of Future Genetics, and this is EMPOWERMENT. One of the ways for people and individuals to become empowered is to understand the drivers and risk factors associated with diseases such as Diabetes. 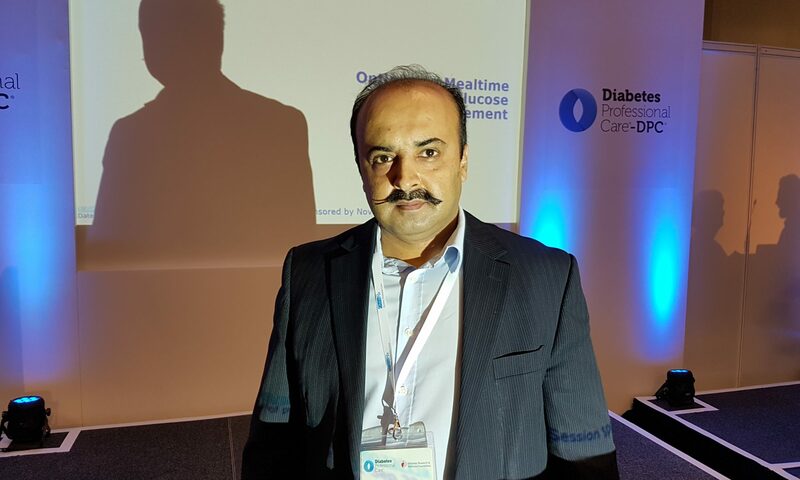 Dr Chirag Bakhai gave a presentation titled NHS Diabetes Prevention Programme – The Healthier You. This succulently highlighted the alarming statistics associated with disease. In my article, I have summarised the key points, and hope this will EMPOWER the listener or reader to be proactive and take actions to avoid poor outcomes. Type 2 diabetes more likely develops in males, people over 40, certain ethnicities, those with high blood pressure and sedentary lifestyles. However, 80% of cases are linked to obesity. Type 2 diabetes can lead to blindness, kidney disease, amputations, heart disease, strokes and early death. 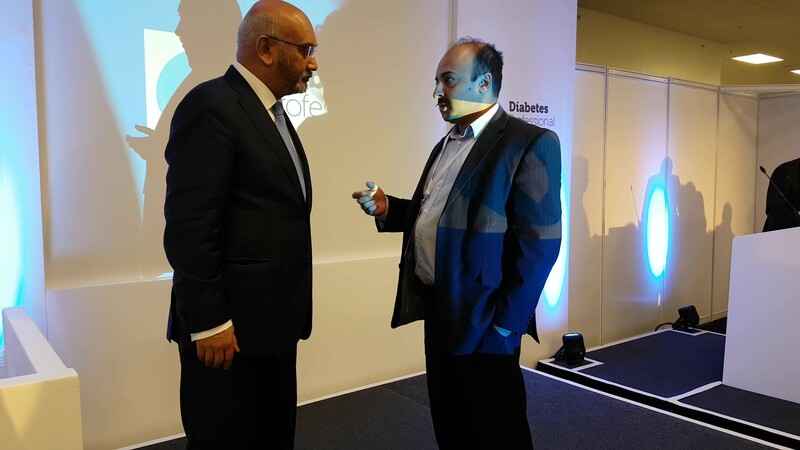 Prevalence of diabetes has doubled in the last 10 years, costing the NHS billions. 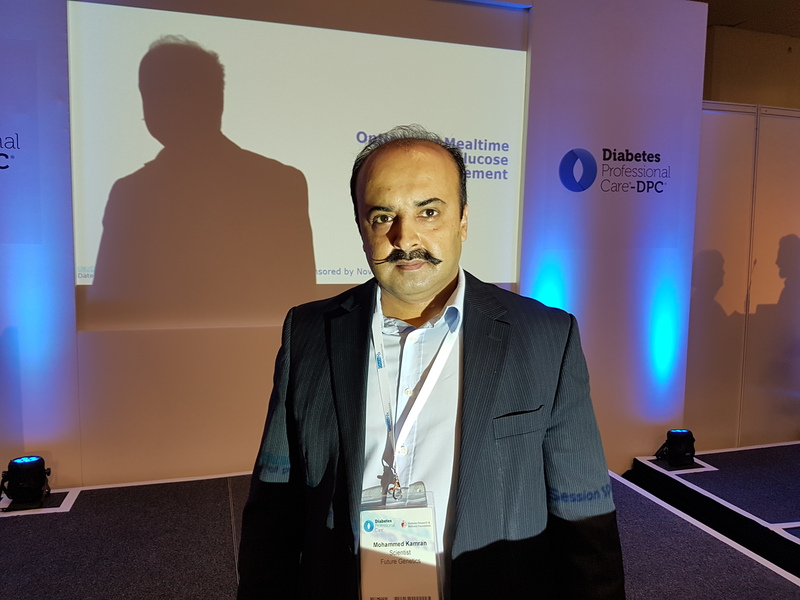 The Healthier You programme was created to prevent diabetes development from prediabetes; a state of hyperglycaemia. Prediabetes implies inevitability of development; however, lifestyle intervention can slow or even halt the progression. The programme is available to most except children, pregnant women or diabetics. It is a free, 16 session treatment plan which takes 9-12 months to complete, it’s tailored to the individual involving psychological training to make lasting behaviour changes to increase levels of physical activities, improve nutrition and maintain a healthy weight. It’s available throughout the whole of the UK and they’re on target to have 100k participants by 2020 as 54% of referrals attend the meetings. 45% are under 65, allowing for early assessment and intervention but more attend if they’re past working age. There are 44% male participants, a higher proportion than in commercial weight loss programmes and those who attend more than 60% sessions, lose on average 3.3kg, exceeding to predicted 2.5kg weight loss. The need for face-to-face interaction at meetings is a restriction for people with modern-day busy schedules and so digital meetings may be offered instead, but these have been found to be less effective. To broaden their client capacity, more funding is required, however the programme is predicted to save the NHS money in the long run. 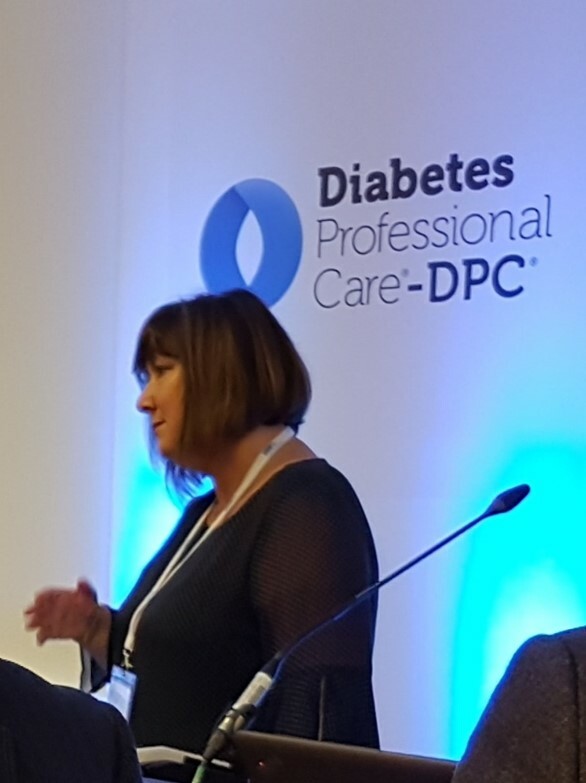 As beneficial as this programme is, more is required to tackle type 2 diabetes, by public health working with the food industry to minimise processed foods, refined carbs, excessive calories and portion sizes. Tackling obesity in schools will also significantly reduce the risk of prediabetes developing in the first place. 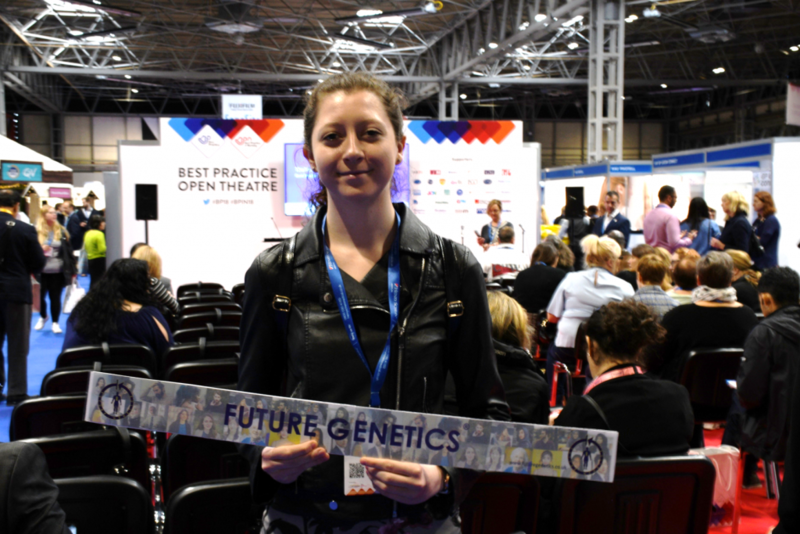 At Future Genetics, we are committed to trying to make a real difference to people and patients with respect to health outcomes. 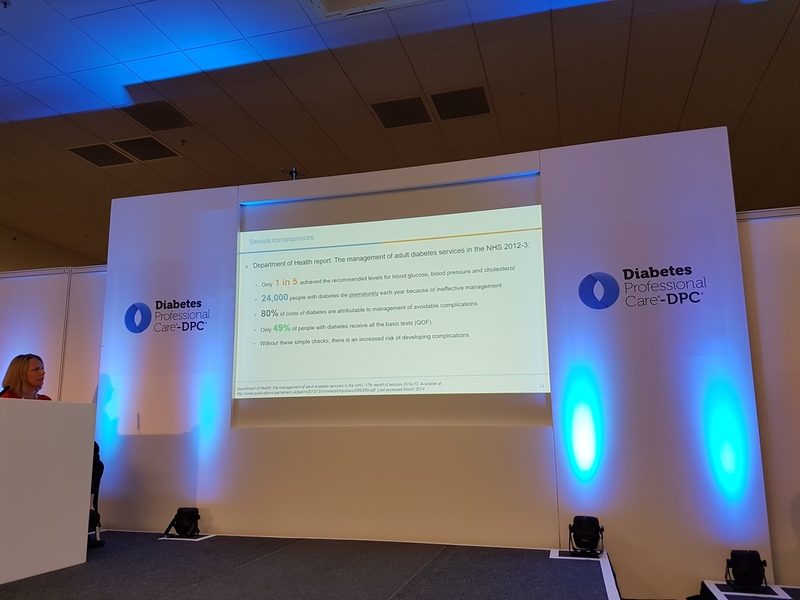 One of our principle research programmes is around diabetes and finding genetic markers that can meaningfully improve health outcomes for people. Thank you or watching and for some of you, reading. The NHS continues to take great strides in making a significant contribution to improving the wellness of a population that (at the same time) continues to increase in size and complexity. This introduces challenges to both public and private sector organisations and systems to meet the patient needs and demands. The challenges on the healthcare system can be addressed in a number of ways. This includes strategies that further improve on preventing disease, with a focus on bridging differences in health inequalities. Another key approach is the need to understand gaps and differences in the care, and quality of different patient populations. A key strategy that could add to the armamentarium of healthcare professionals would be to utilise new technology that could facilitate improving health outcomes in the UK population in the form of earlier diagnosis, better health as we age, and improved recovery from illnesses and medical interventions. 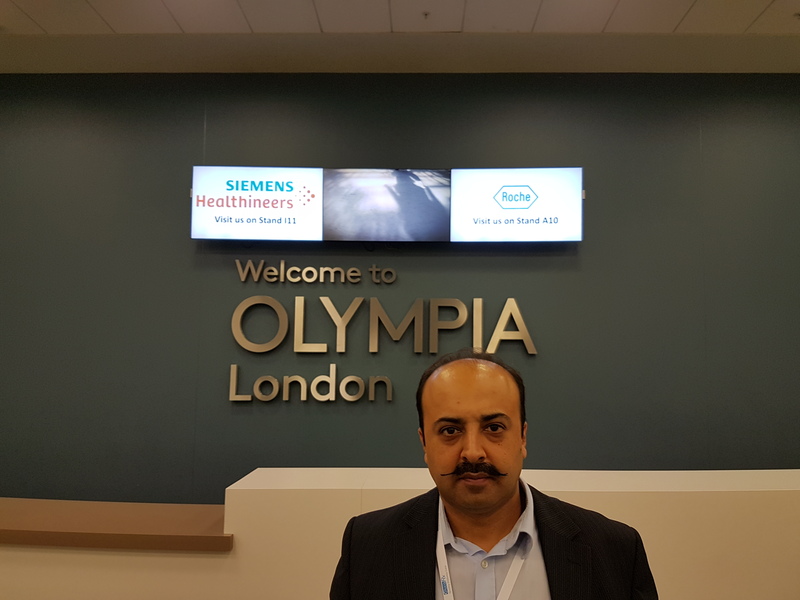 Clinical technologies need to be developed and appropriately tested for their effectiveness in delivering on their given promise in a timely manner. The process of research and development (R&D) can be a long one. As a matter of fact the vast majority of R&D companies striving to develop new medical technologies are indeed Small to Medium sized companies. Transitioning from concept, research programmes, and testing can be daunting and a challenge. 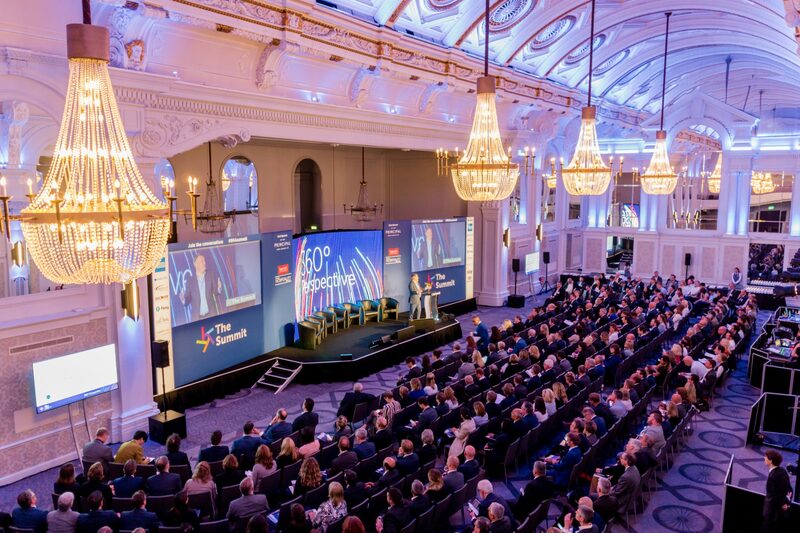 This has been realised by the UK Government and there has been significant investment to support Research companies to deliver on new and exciting medical technology that can lead to better healthcare for all. 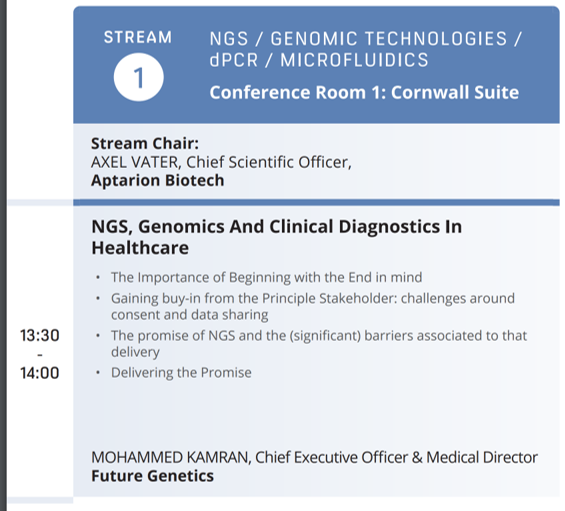 Representing Future Genetics, I attended the launch event of the Medical Devices Testing and Evaluation Centre (MD-TEC). 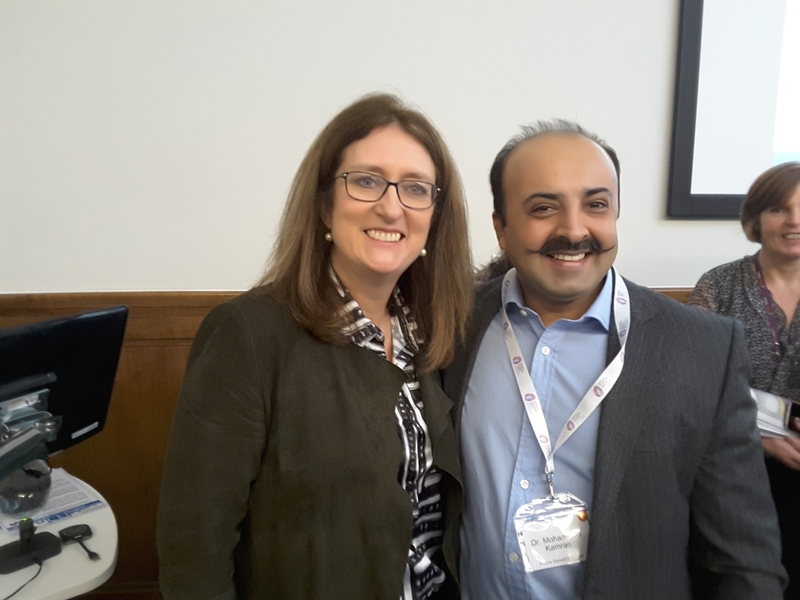 It was chaired by the former UK Home Secretary for the Labour Government, Jacqui Smith, who is now the Chair of the University Hospitals Birmingham NHS Foundation Trust. There is a need to have an infrastructure in place to accelerate and bring to market technologies. 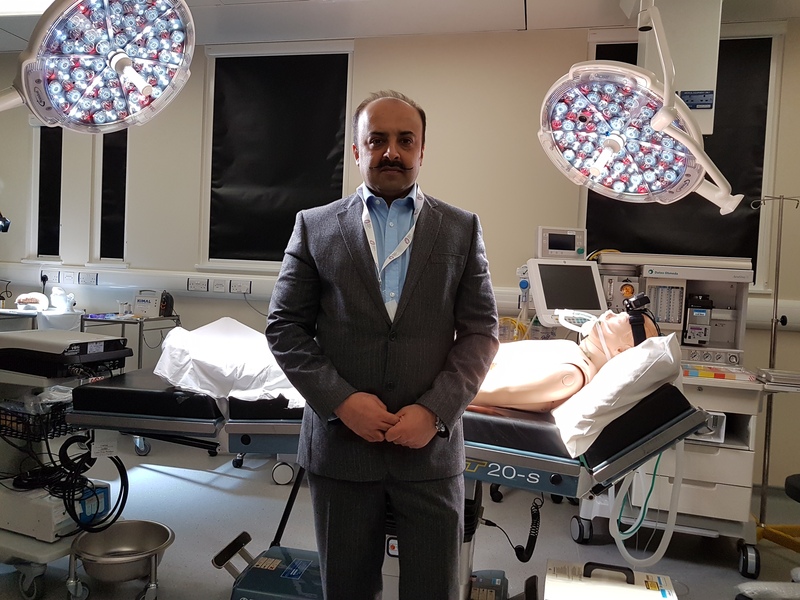 The function of this newly purpose-built MD-TEC site is to help expedite the transition of clinically innovative technologies from the research bench through to medical utility. This would facilitate streamlining delivery for the benefit of NHS patients and the wider UK population. Many research organisations do not have the full gamut of resources to deliver on goals. Therefore, multi-disciplinary collaboration by Research companies with NHS sites and other research and specialist organisations such as MD-TEC is critical. The MD-TEC site provides state-of-the art facilities for Research companies. During a tour of the facility I was able to see the “pre-patient” set-up that allowed for testing of novel medical technologies and devices. This included a functioning operating theatre, A&E, and ICU facility to test technologies and devices on highly sophisticated “dummies”. Thus any unnecessary human trials or studies can be avoided. In addition, this would also facilitate the design of even better downstream clinical studies. 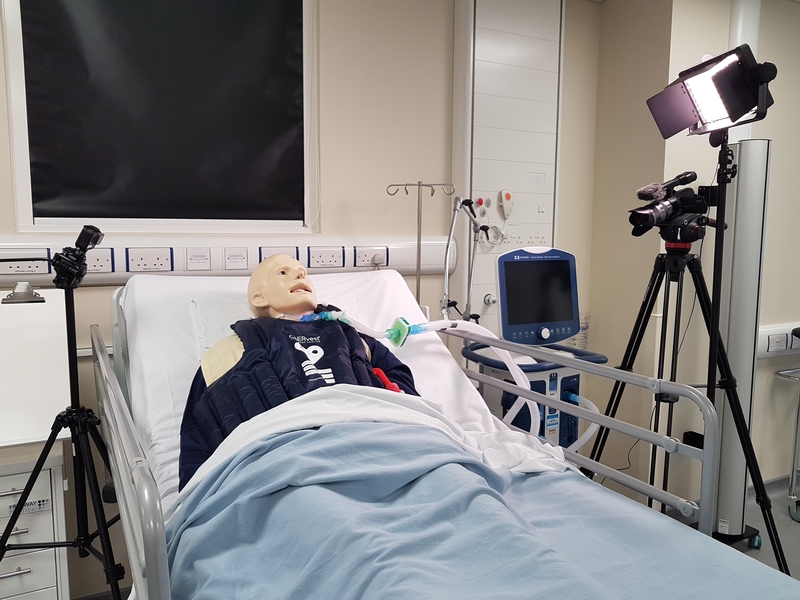 A functioning surgical theatre with a responsive dummy to test the robustness of medical technologies before the start of any human studies (NHS patient outcomes). 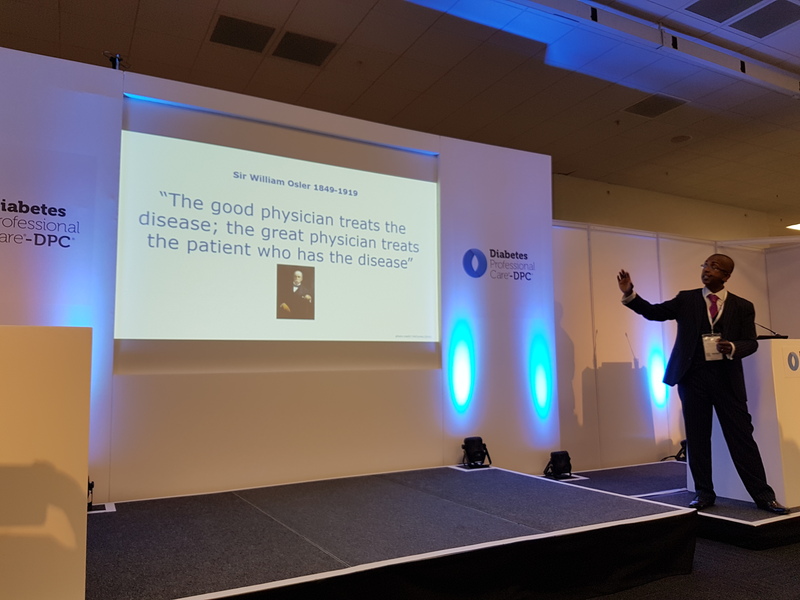 The concerted effort by government bodies; organisations such as Innovate UK, SBRI, and the NIHR i4i; charities including Diabetes UK and the British Heart Foundation; different Academic Science Networks across the country (with the WMAHSN being the closest to me); and different NHS Trusts to support innovative research and inter-disciplinary collaboration can only be good for NHS patients and the wider UK population.